Since its foundation in 1957, Laboratoire HUCKERT'S INTERNATIONAL is dedicated to offering high performance disinfectants to fight contamination and protect the healthcare professional from infection risks whilst offering alternative solutions with no side effects. As an expert in bio decontamination and disinfection we never compromise on quality: the manufacturing is carried out in a controlled environment according to a quality assurance system that guarantees full traceability and reproducibility of the products. 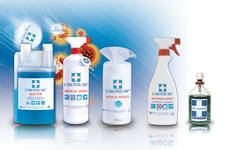 The company manufactures two product ranges: UMONIUM38® - the excellence in cleaning and disinfection of medical devices, equipments and surfaces - and PHYTOGEL a skin care program based on medicinal plants to deliver exceptional hygiene while also caring for real well-being at work. We believe that a disinfectant should not substitute a biological hazard with a chemical one. In this highly sensitive field of disinfection, Laboratoire HUCKERT’S INTERNATIONAL is certified ISO 9001:2000 and ISO 13485:2003 (medical devices).